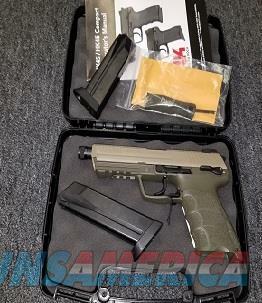 Description: This is a "Like New" used (less than 200 rounds through it) Heckler & Koch HK45 Tactical . It has a 5.5" H&K Threaded barrel and thread protector with an OD Green and FDE finish. It comes with Tritium Night Sights, two 10 round magazines, manual, lock, additional grip size, and "O" rings, and Hard Case. A Gtac holster and extra magazines are available for purchase. This is a cash price but you can use a credit card. Just add 3% to the gun price and shipping fee. 3% will be invoiced after check out. Our payment policy is, we need to receive payment by online payment or other arrangements within 48 hours after your commitment to purchase regardless of the website rules. I DO NOT TAKE RETURNS UNLESS OTHERWISE AGREED UPON. Please make sure what you are purchasing is legal in your state or that you are sure you wish to purchase this item. There is a 20% restocking & relisting fee for any guns purchased that you either back out on the purchase after payment or that are not legal in your state or have to be returned due to a failed background check. All warranty issues must be done by the manufacturer for any issues or defects. Florida residents must pay Florida Sales Tax of 6%. An Additional fee of $50.00 for California sales will be invoiced after order is placed. Trades Accepted: Yes we take trades. We are a US Military Veteran ran business. We ship Legal firearms and magazines to California!!! It is your responsibility to ensure the firearms you purchase are legal in your state.